“All Of Us”, a 24×30″ mixed media acrylic on stretched canvas, sides painted black. $225. I am a huge fan of author Kurt Vonnegut. I’ve read many of his books (although not all -yet). 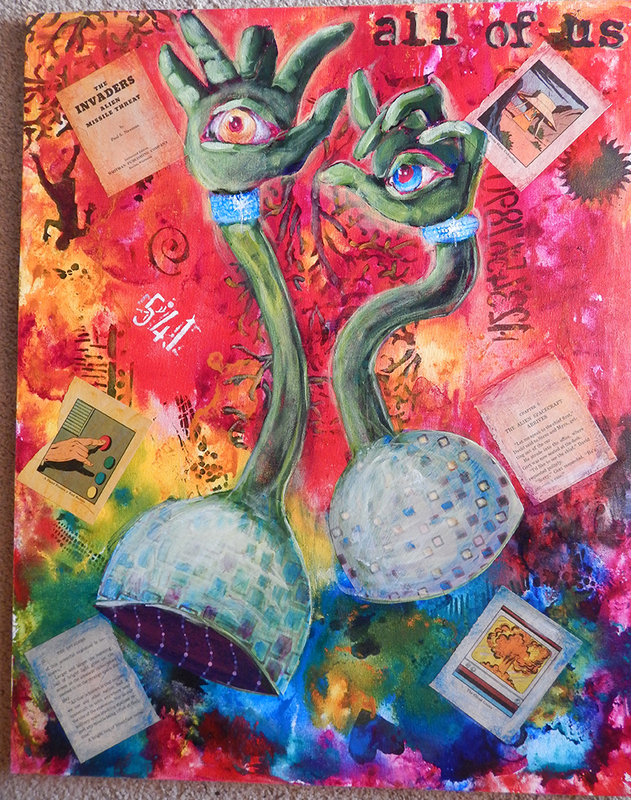 When an opportunity arose to make an alien painting for a local group show, Vonnegut’s Tralfamadorian aliens from his novel “Slaughterhouse 5” waddled into my brain pan immediately. It was a no-brainer. But perhaps it helps to be a Vonnegut fan to really appreciate this painting, because how many will want to own a painting of animated toilet plungers? Let me answer that….YOU DO!!!! !